pDepartment of Radiology (M.W. ), Neuroradiology Division, Stanford University, Stanford, California. SUMMARY: Identification of carotid artery atherosclerosis is conventionally based on measurements of luminal stenosis and surface irregularities using in vivo imaging techniques including sonography, CT and MR angiography, and digital subtraction angiography. However, histopathologic studies demonstrate considerable differences between plaques with identical degrees of stenosis and indicate that certain plaque features are associated with increased risk for ischemic events. The ability to look beyond the lumen using highly developed vessel wall imaging methods to identify plaque vulnerable to disruption has prompted an active debate as to whether a paradigm shift is needed to move away from relying on measurements of luminal stenosis for gauging the risk of ischemic injury. Further evaluation in randomized clinical trials will help to better define the exact role of plaque imaging in clinical decision-making. However, current carotid vessel wall imaging techniques can be informative. The goal of this article is to present the perspective of the ASNR Vessel Wall Imaging Study Group as it relates to the current status of arterial wall imaging in carotid artery disease. The goal of this article is therefore to present the perspective of the ASNR Vessel Wall Imaging Study Group on the current status of arterial wall imaging in carotid artery disease. NASCET, ECST, and ACAS used DSA to assess the percent reduction in the luminal diameter of the artery. The methodology for carotid stenosis quantification is debated because NASCET and ECST used indirect ratio-percent methods.31 Stenosis measurements with NASCET and ECST differ substantially: With the ECST method, twice as many stenoses were classified as severe, and less than one-third of the number of stenoses, as mild compared with the NASCET method.32 Techniques that enable identification of both outer and inner walls of the artery might lead to more accurate assessment of risk. Bartlett et al33 suggested the use of this direct diameter–based measurement to overcome the limitations of the percent-based methods, and the results they found suggest that this technique could be efficient. These studies introduced the following new concepts: 1) The degree of carotid stenosis is a weak indicator of the volume and extension of carotid plaque42⇓–44; 2) a set of plaque features identifiable by imaging are closely linked to the development of ischemic symptoms; and 3) these features can significantly increase the risk of stroke regardless of the degree of stenosis.45⇓⇓–48 Thanks to advancements in the imaging techniques to specifically target the vessel wall as opposed to the vessel lumen, considerable research effort is underway to identify those plaque-related parameters that, together with the degree of stenosis, can more accurately predict the presence of vulnerable plaque and the associated risk of ischemic events. More than 30 years ago, Imparato et al8 found that there were certain plaque features, such as IPH, that were associated with an increased risk of plaque rupture and distal embolization. Since that time, roughly 1000 articles have been published on IPH as well as ones characterizing additional features associated with plaque vulnerability, including the thickness of the fibrous cap, rupture of the cap, the presence and size of the LRNC, and the presence of active plaque inflammation. Vulnerable plaques also tend to be characterized by an eccentric distribution, an irregular surface of the intimal layer, or superficial ulcerations with intimal exposure. The concept of plaque remodeling was initially described for atherosclerotic lesions in coronary arteries but is largely accepted for other vascular beds, including the carotid arteries.95,96 Carotid plaques can show either positive or negative remodeling or both. Positive remodeling is dilation of the vessel wall in response to an increase in plaque volume with little or no compromise of the vessel lumen as the vessel initially attempts to maintain normal lumen diameter.97 Negative remodeling is present when the vessel lumen diameter is decreased (stenosis). It is clear that there are several plaque features of increased clinical risk supported by associations with endarterectomy specimen analyses. It is of utmost importance to test management strategies based on these MR imaging–defined features of risk before treatment guidelines can be established. Currently, there are several prospective trials intended to examine the value of prospective plaque imaging (Atherosclerosis Risk in Communities [ARIC], Plaque At RISK [PARISK], Carotid Plaque Imaging in Acute Stroke [CAPIAS], Chinese Atherosclerosis Risk Evaluation-Phase II [CARE-II], and Canadian Atherosclerosis Imaging Network [CAIN]).103⇓⇓⇓⇓–108 In the meantime, it is possible that carotid plaque characterization may be of immediate clinical value today. Given that the presence of IPH, large LRNC, and/or a thin-ruptured FC is associated with a higher risk of future cardiovascular events, the presence of these plaque features may warrant closer clinical follow-up and consideration for more intensive medical therapy. Despite attempts to encourage all physicians to manage atherosclerosis medically with current evidence-based guidelines, many patients are not receiving high-intensity lipid-lowering therapy, even when indicated. Providing additional information based on carotid plaque MR imaging identification of IPH, large LRNC, and/or a thin-ruptured FC may improve patient/physician compliance with current therapeutic guidelines. If patients receiving standard-of-care medical therapy have repeat strokes ipsilateral to carotid plaque harboring “vulnerable” plaque features, they may warrant surgical intervention even if they do not meet the stenosis thresholds by the NASCET criteria. In this section of the paper, we will summarize the imaging techniques that can be used in the imaging of the carotid artery wall. US is generally accepted as the standard imaging technique for first-line diagnosis of atherosclerosis of the carotid artery.67 US has shown very good results in the identification and characterization of high-risk plaques in patients with atherosclerosis.109 In particular, the use of microbubble contrast material facilitates assessment of vulnerable plaque features such as the presence/absence of neovascularization.110,111 The recently introduced volumetric US technology seems to add further value to this technique by improving the interobserver concordance and increasing the spatial coverage.112 Another US technique that could be used for carotid plaque characterization is intravascular US (IVUS). The advantage of IVUS is excellent spatial resolution, which is possible given the short distance between the probe and the carotid plaque, which permits the use of high-frequency (up to 50 MHz) insonation without excessive attenuation. Some authors have explored the potential of conventional US to characterize the FC, but the results obtained were suboptimal.120⇓–122 Recent articles123,124 have suggested that intravascular ultrasonography can assess in detail plaque structure and the FC but with associated procedural risk. Recent studies assessed the reliability of US for assessing certain plaque features. Bar et al130 assessed plaques in 30 patients. Interrater agreement values for the following plaque features were as follows: homogeneity, 96% (κ = 0.84; P < .001); surface characteristics, 90% (κ = 0.77; P < 001); and echogenicity, 86% (κ = 0.60; P < .001). The correlation coefficient for plaque content and volume measurement agreement was 0.81, and measurements did not differ significantly (P = not significant). In an article published in 1999 by Hartmann et al,131 the κ values and 95% confidence intervals for interrater reproducibility were 0.05 (−0.07 to 0.16) for plaque surface structure, 0.15 (0.02 to 0.28) for plaque heterogeneity, 0.18 (0.09 to 0.29) for plaque echogenicity, and 0.29 (0.19 to 0.39) for plaque calcification. The upper bounds of all the confidence intervals were below the 0.40 level, indicating very low reliability. Modern CT scanners can provide exquisite, rapid high-resolution imaging of the carotid artery lumen and the arterial wall. The introduction of multienergy technology provided a tremendous boost to the development of CT techniques; and constant advances in detector technology, in spatial and temporal resolution, and release of advanced software for image reconstruction have helped to consolidate this technique as a reliable tool for the evaluation of arterial pathology, with particular success in the detection and characterization of carotid atherosclerosis. Plaque volume analysis in a 75-year-old man with a TIA. In the volume-rendered image, the carotid is traced (A), and in the curved-planar-reconstructed postprocessed image (CTA module, Aquarius iNtuition Edition, Version 44121382907; TeraRecon, San Mateo, California) (B), the plaque is identified based on the green contours (white arrows). The volume analysis with automated boundary detection and tissue segmentation is shown in panels C, D, and E (corresponding to the 3 arrows, proximal-to-distal) with contours delineating the lumen (red contour), outer wall (blue contour), and shading of calcium (blue), mixed tissue (green), and lipid component (red). CT offers very good results in detecting ulcerations when compared with histopathology (Fig 2), with performance significantly better than US,134⇓–136 but the presence of a halo or edge blur may hinder detection of smaller ulcerations. 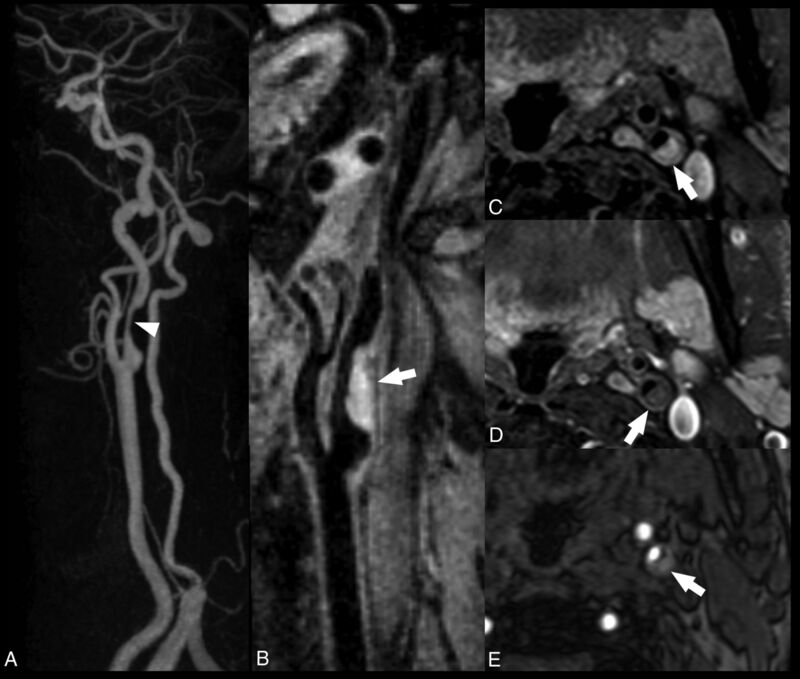 Ulcerated carotid artery plaques detected with CT and MR imaging. 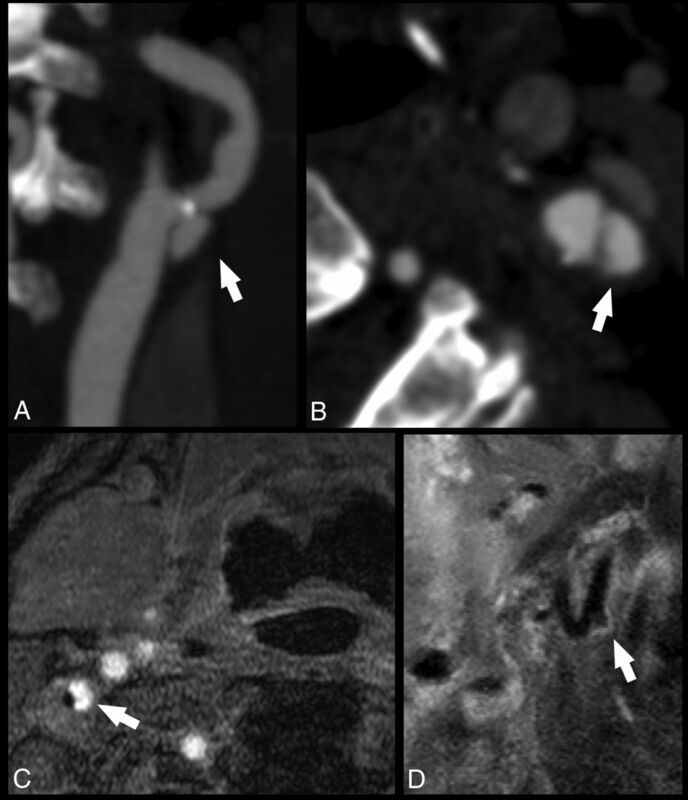 In the first case, the CTA of a 74-year-old man with a TIA demonstrates an ulcerated carotid artery plaque (white arrows) in the left internal carotid artery (white arrow) in the MIP (A) and axial source (B) images. In the second case, an MR imaging analysis of a 63-year-old man with a TIA shows a tiny ulceration (white arrows) in the right internal carotid artery visible in the axial (C) and paracoronal (D) planes. CT imaging has 3 main limitations: 1) the radiation dose delivered to patients, 2) the risk related to the administration of contrast material, and 3) the limited fatty tissue contrast. Diagnostic radiation exposure and the consequent potential radiation hazards represent a significant issue,150,151 particularly when longitudinal monitoring is required. The second limiting factor of CT is the potential anaphylactic reaction to contrast material152,153 and contrast-induced nephropathy, which is a common form of hospital-acquired acute renal failure.154,155 A further limitation of CT is the limited published information concerning the reliability of this technique and the prospective value of CT-based plaque features on stroke risk and/or stroke recurrence. The use of a high field strength (1.5T–3T) and dedicated surface radiofrequency coils improves the signal-to-noise ratio, which allows for the evaluation of plaque components and investigation beyond the simple assessment of stenosis measurements. Multicontrast carotid MR imaging (including T1WI, T2WI, and proton density and TOF) can characterize plaque components (eg, fibrous cap, LRNC, calcification, and intraplaque hemorrhage) without administration of contrast agents. Contrast-enhanced MR imaging improves tissue characterization60,61 and offers information on the presence of neovascularization (Figs 3 and 4). Carotid atherosclerotic plaque MR imaging and a specimen from a 73-year-old man with stenosis of the carotid bulb measuring 69% by the NASCET criteria demonstrated on a contrast-enhanced MRA (A). The precontrast (mask) image from the contrast-enhanced MRA demonstrates bright signal indicative of intraplaque hemorrhage, specifically subacute blood, or methemoglobin (B, arrow). Subacute blood is also identified as bright signal on the precontrast T1-weighted black-blood image (C, arrow). A rim of hemosiderin is identified as hypointense signal on the postcontrast black-blood image (D) and a hemosiderin-sensitive sequence (E) and is confirmed on the endarterectomy specimen (F and G). The fibrous cap is also delineated (green arrow, D and F). Black-blood imaging was achieved by using 2D cardiac-gated double inversion recovery turbo spin-echo. ECA indicates external carotid artery; CCA, common carotid artery; TFE, turbo field echo. Carotid atherosclerotic plaque MR imaging and a specimen from a 76-year-old woman with transient ischemic attacks ipsilateral to carotid bulb stenosis, measuring 47% by the NASCET criteria demonstrated on a contrast-enhanced MRA. A, Narrowing is caused by the plaque characterized by 2D cardiac-gated double inversion recovery black-blood MR imaging (B). Regional enhancement (green arrow) within the lipid core (yellow arrow) suggests focal inflammation with neovascularity as confirmed on the endarterectomy specimen (C, green circle). Contrast enhancement is also useful for delineating the fibrous cap (B and C, orange arrowheads). Calcification is identified as areas of hypointensity (B, red arrows, and C, red circle). MR imaging detects plaque ulcerations with a sensitivity similar to CT (Fig 2).156 Etesami et al156 demonstrated that the use of contrast-enhanced MRA techniques improved the sensitivity for ulcerations by 37.5% compared with an unenhanced time-of-flight sequence. Smooth left internal carotid artery stenosis with intraplaque hemorrhage. All images were acquired with a 16-channel neurovascular coil at 3T. The CE-MRA demonstrates a smooth, nonulcerated stenosis in the bulbous and postbulbous parts of the left internal carotid artery (white arrowhead, A). Oblique reformat of a coronally acquired MPRAGE image shows extensive intraplaque hemorrhage, which appears hyperintense (white arrow, B). The IPH is hyperintense on the nonenhanced T1 fat-saturated spin-echo image (C) and isointense on the gadolinium-enhanced T1 fat-saturated spin-echo image (D). On the TOF MRA source data, the IPH also appears hyperintense but to a lesser degree than the intraluminal flow signal (E). Matched cross-sectional images of a carotid plaque with high signal intensity (white arrows), consistent with the presence of intraplaque hemorrhage on MPRAGE (A) and SNAP MR imaging (B). Note the greater conspicuity of the carotid lumen (L) on SNAP compared with the MPRAGE image. There is a penetrating ulcer (asterisk) that is more easily detected on SNAP compared with the TOF MRA image (C). In a 68-year-old male patient, coexistent plaque components, fresh intraplaque hemorrhage (arrows), and superficial calcifications (arrowheads) are detected by MATCH (first row) and the conventional multicontrast protocol (second row). 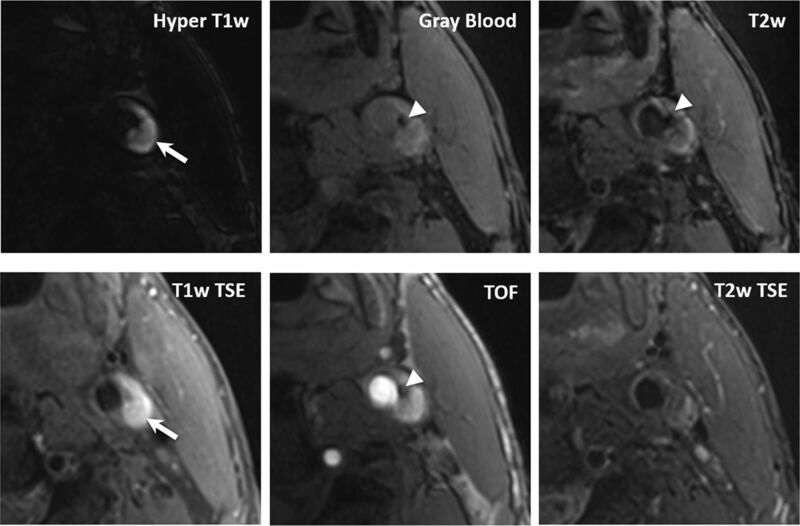 Compared with T1-weighted TSE and TOF, MATCH provides more conspicuous depiction of intraplque hemorrhage on the hyper-T1-weighted image and calcification on the gray blood image. 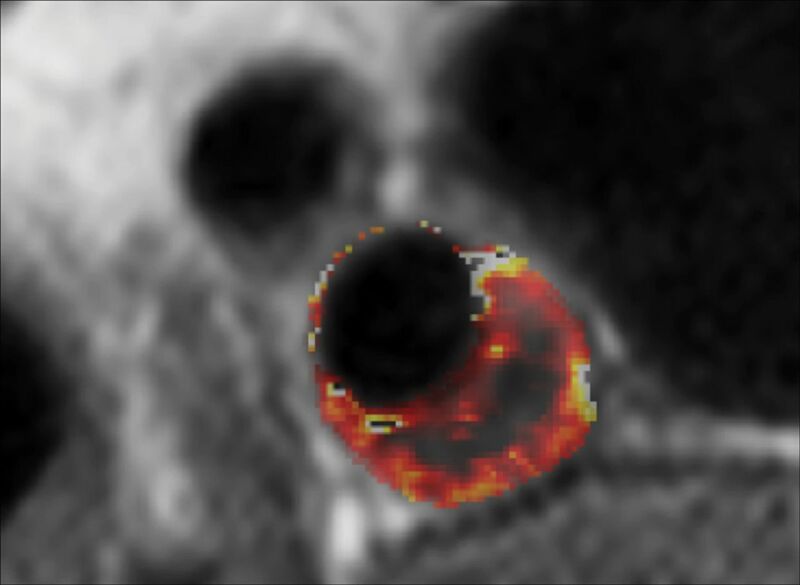 Notice that the calcification is also visible on the MATCH T2-weighted image but not on the T2-weighted TSE image. Initial research demonstrated that LRNC could be detected as a focal hypointense region on T2WI (Fig 8).167,168 Multiple studies have confirmed the improved detection of LRNC seen as a focal nonenhancing region on contrast-enhanced T1WI within the carotid vessel wall.60,61 Larger LRNC size correlates with future ipsilateral carotid symptoms. All validation of LRNC detection/quantification and predictive features has been based on multicontrast carotid plaque MR imaging protocol using dedicated carotid coils. Recent work has suggested the ability to detect a large LRNC using commercially available 3D T1WI sequences and large-FOV neck coils. The Canadian Atherosclerosis Imaging Network has recently completed a prospective, multi-institution study using large-FOV neck coils and commercial sequences from a variety of MR imaging vendors to detect LRNC and IPH. When fully analyzed, CAIN may give us additional information about the ability of IPH and LRNC size detected with large-FOV neck coils and commercial sequences to predict future ipsilateral events. 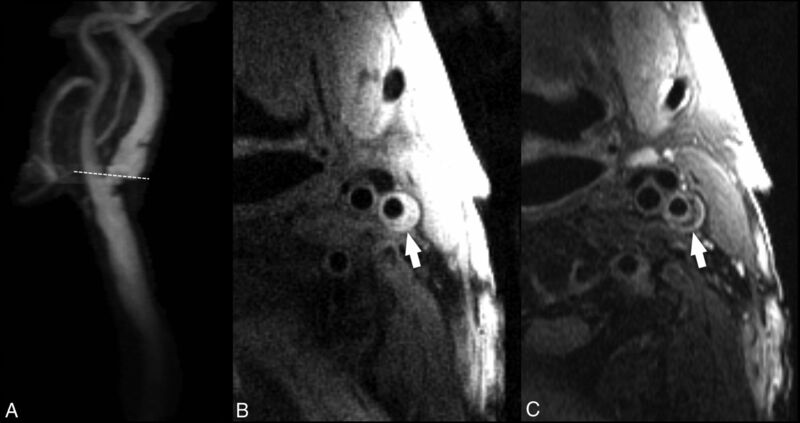 A, Contrast-enhanced MRA of the extracranial carotid bifurcation indicating the level of 2D-FSE images obtained with 1.5T. B, T1-weighted double inversion recovery black-blood FSE image shows an eccentric plaque (arrow) in the internal carotid artery. C, T2-weighted double inversion recovery black-blood FSE image at the same level shows a crescentic, hypointense signal from the necrotic core, which is separated by a higher intensity fibrous cap from the flow lumen. 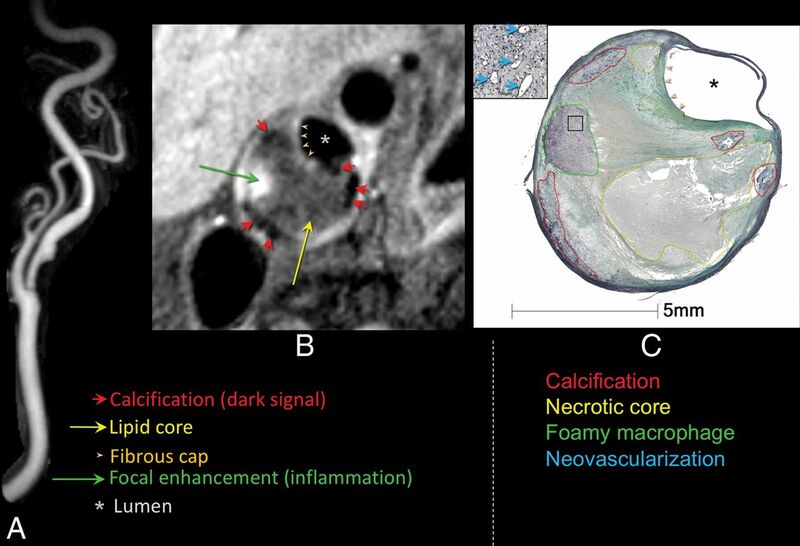 A recent MR imaging study182 showed that enhancement of carotid plaque after administration of gadolinium is associated with neovascularization (P < .001) (Fig 4). The correlation between the degree of plaque enhancement and the degree of neovascularization, which is itself linked to the degree of plaque inflammation, was also confirmed at histology in a recent study by Millon et al.182 Investigations have shown that inflammatory cells are also present at the interface with the underlying necrotic core and in the plaque shoulder region.183,184 From the imaging point of view, it is possible to distinguish 2 different types of neovascularization: 1) adventitial neovascularization, and 2) intraplaque neovascularization. The adventitial neovascularization has been assessed with MR imaging.144 Ectopic neovascularization in the intima and media is a hallmark of advanced atherosclerotic lesions, but the adventitial layer is a fundamental target because it serves as the main source of in-growth of new vessels. The degree of neovascularity measured using gadolinium perfusion methods correlated with adventitial perfusion as measured by its transfer constant (Fig 9).185 Wasserman171 categorized the circumferential enhancement (0, absent; 1, <50%; 2, ≥50%) on postcontrast MR imaging by finding an association between the grade of adventitial enhancement and cerebrovascular events. 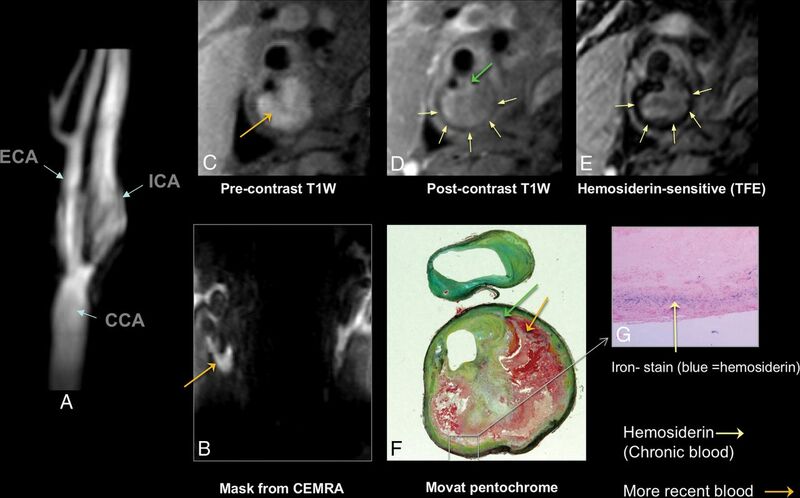 Plaque perfusion imaging using dynamic contrast-enhanced MR imaging has been shown to give reproducible physiologic measurements of the vasa vasorum.186,187 However, protocol compliance may be more important for functional imaging such as dynamic contrast-enhanced MR imaging as compared with anatomic imaging. Volume transfer constant (Ktrans) map of a patient with carotid plaque. Maps were generated using pharmacokinetic modeling of dynamic contrast-enhanced MR images. The parametric map is overlaid on the anatomic MR image, and voxel Ktrans values (Patlak model) are color-coded. The necrotic core exhibits low Ktrans values at the center of the plaque, while the highly vascularized adventitia at the outer rim exhibits high Ktrans values. There is another region of higher Ktrans values near the inner rim of the plaque. An important limitation to contrast-enhanced MR imaging evaluation of plaque that has recently emerged is the potential for gadolinium toxicity, particularly when longitudinal monitoring is required. Recent studies have reported the accumulation of gadolinium in various tissues of patients without renal impairment, including in bone, brain, and kidneys,199⇓–201 and in July 2015, the US Food and Drug Administration published a safety announcement that it is investigating the risk of brain deposits associated with the repeat use of gadolinium contrast agents in MR imaging,202 stating: “To reduce the potential for gadolinium accumulation, health care professionals should consider limiting GBCA [gadolinium-based contrast agents] use to clinical circumstances in which the additional information provided by the contrast is necessary. Health care professionals are also urged to reassess the necessity of repetitive GBCA MRIs in established treatment protocols.” This risk must now be weighed against the potential radiation hazard described earlier that limits longitudinal plaque monitoring by CT.
With the development of deep learning technology and plaque characterization algorithms applied to medical imaging, it is now possible to identify, classify, and quantify target features from imaging datasets such as total carotid artery plaque volume and plaque subcomponent detection (calcium, IPH, lipid core).203,204 Deep-learning technology has experienced rapid progress in health care over recent years, with early reports of implementation in carotid imaging204 raising the prospect of routine use in the clinical setting once validated. “Molecular” imaging techniques have been gaining popularity. The objective of molecular imaging is to provide biologic insight into the identification and classification of carotid artery plaques, especially those at high risk. In atherosclerotic plaques, multiple and complex reactions take place at the molecular and cellular level, with various atherosclerosis-related biomarkers present at different stages of disease progression.205 Conventional imaging with US, MR, or CT cannot identify these components because of limited imaging contrast; therefore, several methods have been proposed that use external contrast agents targeting these specific biomarkers. 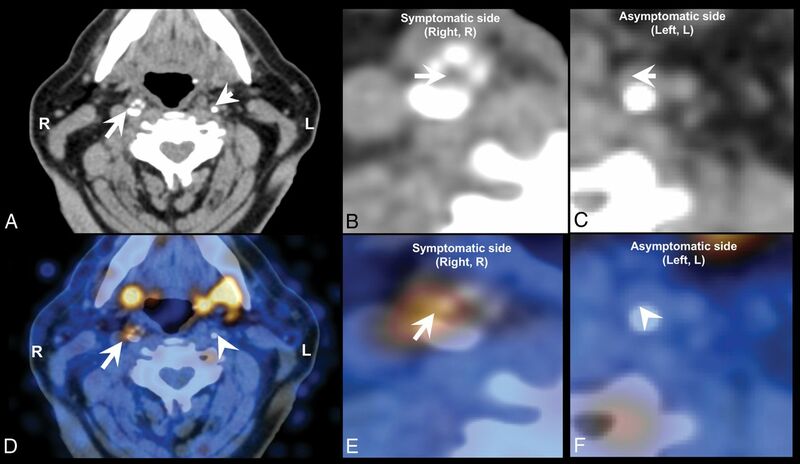 [18F] fluorocholine positron-emission tomography CT (18F-FCH PET CT) image of a symptomatic (arrow) and contralateral asymptomatic (arrowhead) carotid plaque of a patient who experienced right-sided stroke. A, Diagnostic contrast-enhanced CT shows a significant stenosis in the right internal carotid artery because of a calcified plaque, whereas a noncalcified atherosclerotic plaque can be seen on the contralateral internal carotid artery. B, CT, inset on the symptomatic plaque. C, CT, inset on the asymptomatic plaque. D, The fused PET CT image denotes a focal area of high [18F] FCH uptake in the right symptomatic carotid plaque, whereas there is no visible [18F] FCH uptake in the left asymptomatic carotid plaque. E, Fused PET CT, inset on the symptomatic plaque. F, Fused PET-CT, inset on the asymptomatic plaque. 1) To provide general guidelines for carotid MR vessel wall imaging with recommended imaging sequences, spatial resolution, and coverage. Guideline considerations are that the protocol can be applied broadly across a spectrum of clinical scanners and not require specialized software or research keys for implementation, and 2) to recommend future areas for technical development and clinical expansion needs. Essential Features for Identification with Carotid Plaque Imaging. Stenosis and luminal surface condition (fibrous cap and ulceration). Presence of lipid rich necrotic core. Minimum MR Imaging Protocol Requirements for Identification of Essential Plaque Features (1.5T and 3T). Effective blood suppression for a plaque burden visualization sequence. The protocol may include any combination of sequences that meets the minimum requirements set forth above. The sequences used can be either 2D or 3D or a combination, provided that they together meet the minimum sequence requirements above. Overall scan time can be adjusted based on field strength and the availability of specialized hardware such as carotid phased array coils. 3T scanners are recommended for improved SNR. Four protocols are presented based on considerations for 2D and 3D imaging and the use of gadolinium contrast agents (Tables 1⇓⇓–4). If patients are able to undergo gadolinium contrast injection, its use is recommended for the detection and quantification of LRNC and the delineation of the fibrous cap.60,214 Use of large-coverage 3D sequences can detect plaques extending beyond the 4-cm coverage centered on the bifurcation and is preferable. Carotid coils are recommended for use with all protocols, though large-FOV neck coils can detect IPH. It is possible to add a 4-minute 3D MPRAGE sequence to routine clinical carotid MRA protocol. The protocol is similar to Table 1, but with 0.8-mm isotropic resolution using a large-FOV neck coil instead of 0.6 mm using dedicated carotid surface coils. Focal regions of T1 hyperintensity within the carotid plaque that are 15× greater than the adjacent sternocleidomastoid muscle can be used to identify IPH. Motion-sensitized driven-equilibrium215/flow-sensitive dephasing216 flow suppression is required for 3D sampling perfection with application-optimized contrasts using different flip angle evolution (SPACE; Siemens, Erlangen, Germany)/Cube (GE Healthcare, Milwaukee, Wisconsin)/volume isotropic turbo spin-echo acquisition (VISTA; Philips Healthcare, Best, the Netherlands) to ensure effective blood suppression to accurately identify plaque lumen boundaries. Good blood suppression postcontrast requires the use of motion-sensitized driven-equilibrium or double inversion recovery (DIR)/quadruple inversion recovery217 flow suppression. For DIR, the inversion time can be calculated based on estimated T1 values of blood at 5-minute intervals following contrast administration (0.1 mmol/kg) for 1.5T or 3T scanners.218 We recommend a TI of 250 ms for 3T scanners for a TR triggered at a 1 RR interval, which generally produces adequate flow suppression beginning 5 minutes after injection despite variations in postinjection scan time and heart rate, which will affect the T1 blood values. Lumen. Quantifying luminal narrowing is a prerequisite, as stenosis severity is the cornerstone for treatment decisions in current clinical guidelines. Furthermore, detection of ulceration provides prognostic value. Use of TOF MRA for lumen assessment avoids the need for IV contrast and may provide confirmatory evidence of intraplaque hemorrhage and sometimes calcification. Addition or substitution with CE-MRA should be considered for those without contraindication for contrast administration. This would also provide an opportunity to perform post-contrast-enhanced imaging of the vessel wall for direct identification of the LRNC and identification/confirmation of fibrous cap status and ulcerations. Plaque Burden and Distribution. Knowledge of the location and distribution of plaque assists in preprocedural planning. Time-efficient 3D large-coverage black-blood MR imaging may be better suited for this purpose. Future Improvements and Needs for MR Imaging. Improved spatial resolution both in-plane and through-plane to better characterize finer structures such as fibrous caps. More effective blood flow suppression for large-spatial-coverage imaging acquisition and pre- and postcontrast administration. Dedicated carotid coils that are integrated with head and neck coils for extensive coverage. Improved techniques for identifying the lipid rich necrotic core, especially without the need for contrast application. More effective methods to deal with motion. A streamlined imaging protocol that is able to identify multiple imaging targets in 1 or 2 imaging sequences. Effective image-processing tools for efficient quantitative identification of imaging targets. Development of training programs for MR imaging specialists on image acquisition and for radiologists on vessel wall image interpretation. Ultimately, a guideline that clearly calls for the need for carotid plaque imaging and 1 simple protocol that can meet all the needs. Currently, there are many new techniques being developed for carotid plaque imaging. 3D-SNAP provides non-contrast-enhanced MRA and simultaneous IPH detection.164 3D spoiled gradient-recalled echo pulse sequence for hemorrhage assessment using inversion recovery and multiple echoes (3D-SHINE) provides information about the state of IPH in addition to IPH detection.220 IPH can also be identified on a precontrast mask of CE-MRA if available.63 MATCH provides comprehensive information regarding plaque composition in a single sequence.163 3D Multiple Echo Recombined Gradient Echo (3D-MERGE)221 and 3D delay alternating with nutation for tailored excitation with fast low-angle shot (3D-DASH)222 provide large-coverage blood suppression for plaque burden measurements. Diffusion-weighted imaging can detect LRNC without the use of contrast media.223 Self-gating has been used to reject data acquired during swallowing motion.224 T1-insensitive blood-suppression techniques such as quadruple inversion recovery217 provide good blood suppression for postcontrast imaging. However, these supplementary techniques require specialized equipment (3T, custom carotid coils, custom sequences) and more intensive interpreter training. 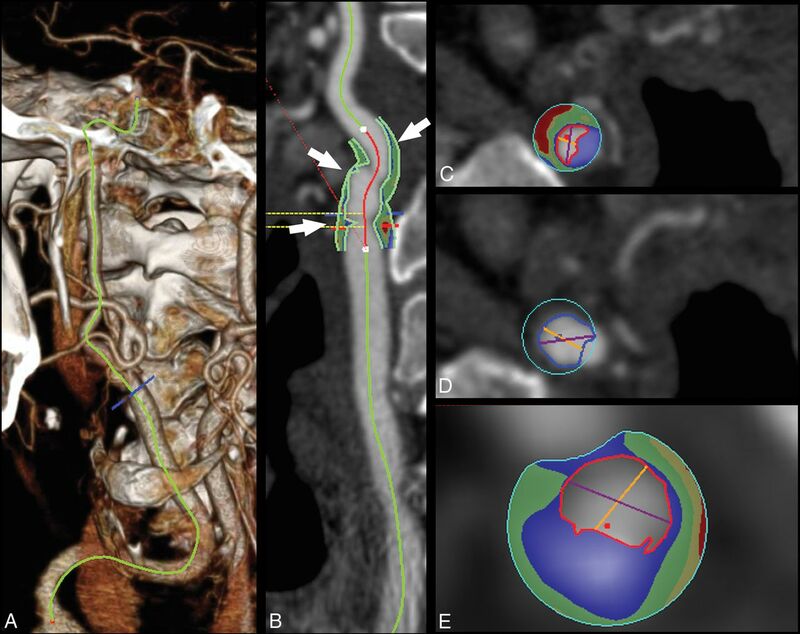 1) To provide general guidelines for carotid CT vessel wall imaging with recommended desirable imaging techniques, tissue contrast, spatial resolution, and coverage. Guideline considerations are that the protocol can be applied broadly across a spectrum of clinical CT scanners and not require specialized software or research keys for implementation. 2) To recommend future areas for technical development and clinical expansion needs. Stenosis and luminal surface condition (plaque morphology and ulceration). Type of plaque (fatty versus mixed versus calcified). Minimum CT Protocol Requirements for Identification of Essential Plaque Features. CT generation: third with at least 16-detector-row. Four protocols are presented (Tables 5⇓⇓–8). No CT study of carotid arteries must be performed without the administration of contrast material. The use of a biphasic approach (unenhanced scan followed by a contrast scan) allows the assessment of the carotid plaque neovascularization. This is becoming more important but is not considered currently necessary. To reduce the radiation dose delivered to the patients, the z-length of the basal scan should cover only the carotid artery plaque bifurcation (4-cm coverage centered on the bifurcation). The dual-energy CT technique143 allows a virtual unenhanced image to assess plaque enhancement without the need for a biphasic approach. Lumen. Quantifying luminal narrowing is a prerequisite. To correctly assess the degree of stenosis, by avoiding the halo or edge blur, the correct window settings should be used.226 At the current level of technology, the status of the FC cannot be adequately explored by CT. Type of Plaque. According to Hounsfield unit attenuation, the carotid plaque can be categorized as fatty (<60 HU), mixed (between 60 and 130 HU), and calcified (>130 HU). By applying these thresholds, it is possible to identify those plaques with a LRNC from others. Applying the Hounsfield unit classification, however, creates 2 problems that have recently come to light: 1) The Hounsfield unit value of the plaque is dependent on the level of energy applied, as demonstrated by Saba et al132 using multienergy systems, and 2) the carotid artery plaques may show contrast enhancement (by comparing the attenuation values of the basal and postcontrast scans), suggesting that the attenuation value of the plaque obtained after administration of contrast material represents 2 different parameters: the type of the plaque and the degree of neovascularization of the tissue.143,227 This is not a problem if pre- and postcontrast scans or dual-energy is applied (capable of distinguishing plaque from contrast enhancement), but this is not usually done clinically secondary to an increase in x-ray dose. Future Improvements and Needs for CT. Improved contrast resolution for greater discrimination of tissue types in plaque. Improved techniques such as multienergy applications for identifying the lipid-rich necrotic core, especially without the need for contrast application. Evidence-based guidelines that invoke the need for carotid plaque imaging, preferably using 1 simple universal protocol that can meet all needs. Currently, most of the research on carotid artery CT is focusing on methods that 1) reduce the radiation dose delivered to the patients, and 2) improve carotid artery plaque characterization using multienergy tools that promise more accurate detection of plaque components. In the last 20 years, there has been a paradigm shift in the imaging of the atherosclerotic carotid artery, from the assessment of the degree of luminal stenosis to the characterization of plaque. Several features have been identified that are potentially associated with plaque rupture, and imaging has been used to identify these features in vivo. Researchers and clinicians now have several imaging modalities that allow in-depth exploration of carotid artery plaque and its components. Sonography should be considered as a first-line examination, at least for screening, whereas CT and MR imaging improve identification of several plaque features associated with vulnerability. Also promising are nuclear medicine and molecular imaging techniques that can further explore assessment of plaque vulnerability, especially inflammation, but these approaches are still investigational and not part of the main diagnostic algorithm of carotid atherosclerosis. In the future, larger prospective longitudinal studies investigating these technologic advances may fully exploit the clinical potential of vessel wall imaging. The authors would like to thank Drs Stefan Vöö and Wei Zu for their help in image selection for this article. The views expressed in this article are those of the authors and do not reflect the official policy of the Department of Army/Navy/Air Force, Department of Defense, or US Government. The identification of specific products or scientific instrumentation does not constitute endorsement or implied endorsement on the part of the authors, Department of Defense, or any component agency.
. The global burden of cerebrovascular disease. Geneva: World Health Organization; 2000. http://www.who.int/healthinfo/statistics/bod_cerebrovasculardiseasestroke.pdf. Accessed December 6, 2017. Chinese Atherosclerosis Risk Evaluation-Phase II (CARE-II). https://clinicaltrials.gov/ct2/show/NCT02017756. Accessed December 6, 2017. FDA Drug Safety Communication: FDA evaluating the risk of brain deposits with repeated use of gadolinium-based contrast agents for magnetic resonance imaging (MRI). Safety Announcement 7-27–2015. http://www.fda.gov/Drugs/DrugSafety/ucm455386.htm. Accessed December 6, 2017.